In a world where a lot of people are after riches, people want to be rich no matter what it takes. The best cars, houses and the best spouses that money can buy are the only things a lot of people focus on. They believe that without money, very few things can be achieved. But is that truly the case? Would having the best car and house give you a fulfilled life. Take a moment to think about that. Most of us want what other people have not because it is of use to us but because others have it. That’s all. I want a nice car like the one my friend is using. If you have the nice car, then what happens. People have stoop so low to the point that they can lie and cheat just to make money. Well, the law is simple. If you gain money illegally, the money would also go away illegally. Well that is a simple fact. The time it takes for us to realize this is small. Look back into history into people who lived wrongly, how did they end. It does matter that you do it right. At work, it matters that you work right. In a relationship, it matters that you love right. Be a good person. 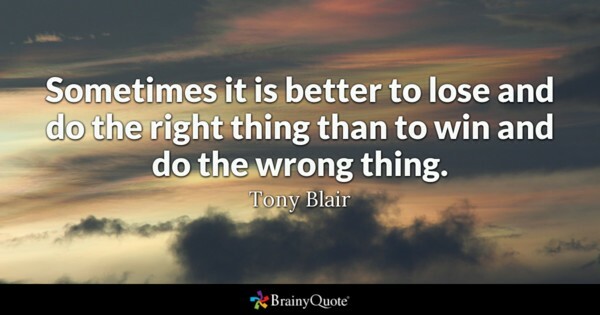 Always do the right things. The consequences would always be right. I remember while I was a kid my mother used to force me to brush my teeth. I never saw the reason for doing that. But today, I fully understand why she did what she did. We may also not fully understand why we must do the right thing today, but give it time, you would be happy you did. Please take your time today to always put in your best and do the right thing. The consequences would in the end be alright. If it is not alright, it is not the end. As Victor Franklin said in his book, If you understand the reason why you are suffering, suffering no longer looks like suffering. You understand you are in something more powerful than you can ever imagine. You are in a path to something greater.